Wistle woke up, stretching with a yawn. She had gotten used to Zecora's hut, happily waking to the smell of herbs, potions and teas. She blinked the sleep from her eyes, and walked slowly over to a carefully placed wall of Zecora's old things. She looked at them, a bright smile on her face. She never dared to touch any of them, but she would always try and figure out what they were. Zecora glanced up from her pot that she was brewing, her blue eyes shining as she watched the pegasus look at the things from her homeland. "Good morning Wistle, good to see you're awake. I hope my spare bed hasn't given any aches? You have awaken earlier then I expected. Perhaps my plan of training you have detected?" Wistle turned her head to see her mentor. "No Zecora, I've slept fine. You have many things that are just divine. I didn't know you had planned training, this is just simply exciting!" She walked over to Zecora, looking at the pot. She had to crane her neck a little bit so she could see what her mentor was brewing. A happy smile hit Wistle's white face, interest taking over. "I'm happy to see you in glee, but this is just my tea." Zecora just chuckled as she turned around to face her second pot, which she had brought out when Wistle had moved in so that they could brew things at different times. "Today lesson will be quite fun, as you get to pick what is done." Wistle nodded, a smile still on her face. "That is quite alright, for I am always in delight. For what I will pick, I'm not sure... maybe a simple Poison Joke cure?" She had definitely caught on to Zecora's rhyming, and she had gotten quite used to it in a short amount of time. Zecora grinned as she picked up a book sitting next to here; Supernaturals: natural remedies and cure-alls that are simply super. "Ah, the little blue flower; the Poison Joke, something I once warned of to six pony folks." She let out a laugh as she recalled the events that led her to meet Twilight Sparkle and her friends. "A simple cure; just a brewed bath, something that without brings out the plant's wrath." Wistle nodded, listening. "Well, it seems simple, a good start. What is the first part?" she asked, simply. She walked over to the other pot, ready to start. ooc: Next post, this girl is getting a cutie mark! Zecora started to trot around her hut, picking up leaves that sat here and there, and whatever else was needed for the Poison Joke cure. Finally, she pulled out a special spice that she had brought from Ponyville on the day she met Wistle. She made her way back to the pegasus and dropped all of the herbs infront of Wistle, grinning. "Look at these herbs and learn how they're cooked; how you mix these in shouldn't be overlooked." With that, Zecora picked back up Supernaturals: natural remedies and cure-alls that are simply super and hoofed it over to Wistle as she nodded. "Follow the list and you will be sure, you will no doubt make the best cure. Most of the time I would show you how to brew, but this is one thing I want you to do." Occ: I don't really know what goes into the Poison Joke cure so just roll with it, and may Zecora be the one to first notice Wistle's cutie mark as she (Wistle) is to busy brewing to notice? ic: Wistle nodded, watching with glee. "Yes, Zecora, now that I see, this may not be as simple as can be. I am up to the challenge, as you may know. This is simply how my knowledge will grow." As she followed the book, putting in herbs and the spice, she didn't even notice. As she started to mix everything, something started to appear. As she was finished, following everything down to the tiniest detail, an herbal leaf was clear. Her cutie mark; it showed that her talent was, and forever would be herbal cure, and tea making. Not noticing one bit, with a rush of pride flowing, Wistle turned and as the bath sat, mixed and finished, just one thing was to be asked; "I have finished with making the cure. But I hope everything is to your liking, just to be sure?" Wistle turned to face her mentor, her golden-green eyes sparkling. Zecora was grinning, having noticed that Wistle had gotten her cutie mark the moment it had started to appear, but had stayed silent. Glancing at the cure, she nodded quickly. "Everything is very good without a doubt but one little thing to be pointed out. Something that I thought to remark...it seems you've gotten a cutie mark." Wistle's ears perked when she heard Zecora's words. "Well, it turns out this is right! Healing and potions are my life's light!!!" she said. She turned her head to see her Cutie Mark... Cool! It was the herbal leaf she had last put in. Awesome! "Something I would hope, my dear Wistle, if not I think we would of been in a pickle." Zecora gazed at the cure, smiling. "The cure is perfect as I knew, but now the question is what to do? Wistle thought... "That question will still sit... Maybe we should test it?" She asked. "There is no cases of Poison Joke about; so we should save it for when one breaks out," Zecora hummed as she trotted around the cure; to pick up a small vial. "To have a finished cure is a good plan; for nopony knows when the sickness may span." Wistle nodded. "Your words are very true, but when it is time, what will be my cue?" What she had meant, was is there a certain thing Wistle should watch for when she had to get it. The fillys' eyes had a smile in them. "Poison Joke name is an important clue; infects a pony with dots of blue. While the dots can't always be seen, the sickness is quite a scene," Zecora rhymed as she glanced at Wistle. "The plant itself is easy to provoke, but all it does it plays a joke. The most important thing to you will be effected; and so it is easy to tell who is infected." Wistle nodded her thanks, and she had to yawn. She was already getting tired; as the filly usually did, but not often since she had came to train with Zecora. As she looked outside from one of the small windows in the hut, she couldn't help but smile. "The Everfree is amazing, I must say it is something. Surely what I didn't expect, even if I haven't checked." Zecora paused as she looked out of one of her hut's windows and into the Everfree beyond. "Perhapes than we shall take a trip? To learn what it holds shouldn't get skipped. Perhaps tomorrow we can go hunting for herbs, also to learn what shouldn't be disturbed." Wistle nodded, the smile still glowing. "I would like to go see, and rest my eyes upon the rest of the Everfree. I love it here in this place, even though I betray the pegasus race." 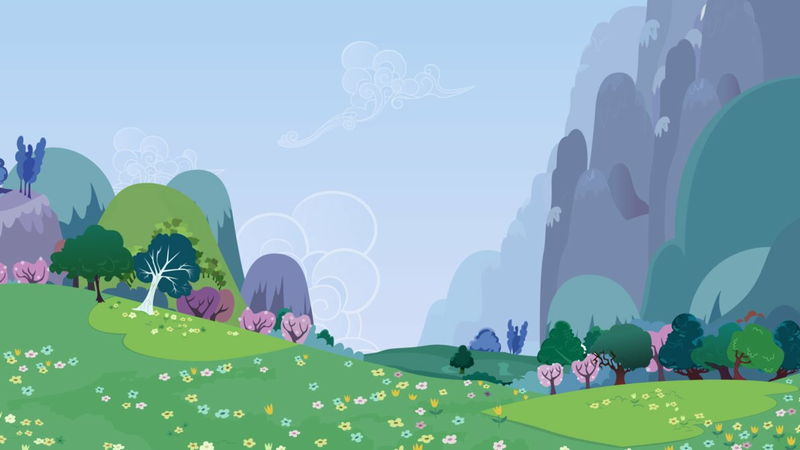 Her new home in the Everfree forest, was a place she did enjoy more then Cloudsdale. Zecora frowned, taking her gaze from the Everfree and focused on Wistle. "Betray is a strong word for one who doesn't like to fly. Have you ever met the pony; Fluttershy?" Wistle looked at Zecora. Fluttershy? No... I haven't... "No, Zecora, I have not. But why does that name require some thought?" She then thought for a moment and had to add; "The reason why that is what I say, is my mother hated my flying way." If you don't understand, when she said "Requires some thought" was because she's heard the name, but didn't know about her. Also, "Hated my flying way" was that she strongly hated her dislike of flight. "Fluttershy is the element of kindness, but when it comes to flying she is a little spineless. She is one of the pegsi race, but the ground is indeed her embrace." Zecora hummed as she thought of the sweet little yellow pegsi, making a note to visit her one day. "She is friends with the famous Rainbow Dash; one who can be a little brash. Just because you live on the ground; doesn't mean that you can't be astound." Occ: By "Just because you live on the ground, doesn't mean that you can't be astound", Zecora simply means that well; because Wistle lives on the ground, doesn't mean she can be amazing and make her mother proud. Wistle nodded; listening. "Thanks for telling me this information; and I've heard Rainbow Dash is a sensation." As she walked over to where one of the windows were; she spotted all sorts of trees and plants that grew around Zecora's hut that she never had really payed attention to before; the small filly was very fascinated with her new home; and she enjoyed it much. "Enjoying the view of the flowers? It is amazing what you can find when you scour." Zecora smiled as walked up next to Wistle, also watching the small flowers and the mighty trees that grew next near her house. She had spent years learning each of the herbs that grew in the Everfree, wanting to know which ones she could use for her brews, and which ones to stay away from. Wistle nodded, as she turned back to the hut. As she looked at the herbs more closely this time, she noticed that each of them were vaguely familiar to the pegasus. As she looked at a pink flower-like plant, she had to ask; "Zecora, I can't help but asking, Is this Hearts Desire I am identifying?